Anyway, an odd way to preface the book (although there is also much expertly-summated dissection of the themes and details of the book... something I should learn something from...) given Fowler actually is already the successful author of dozens of books and short stories. The Bryant and May detective series has many fans, and he has written fun-sounding titles under the excellent Solaris imprint like Hell Train, which is on my list. He has even had one novel turned into a 1992 film starring MacGyver (or Stargate Jack, as readers here may know him better as..?) a as crazy builder for cripes' sake. I want to write a book that ends up as a film with MacGyver in it. That no one has heard of. So I wondered what had held Plastic back. And as I began reading the novel proper, my confusion continued, for each turned page brought enjoyably fresh and compelling descriptions of a life in stasis from our narrator June, who has trapped herself in a suburban prison largely of her own design, with only her shopping addiction to keep her company. Now, before you all fall asleep, this IS a violent, twisted thriller. It all starts with June telling us she is as good as dead, covered in blood and the captive of a menacing thug. There is also a scalpel on the cover. Clear signs. But Fowler then has June guide us, involvingly, through her life choices, her mental state and her marriage collapse, and for quite a while, before the plot that takes her to the bloody doom she greets us with begins to kick in. And it's these early moments I enjoyed the most. 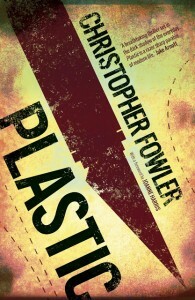 There is a knowing humour yet also a keen eye for emotional realities in Plastic's descriptions of June and her world. It's also a landscape I'm more than familiar with, having grown up largely in the same bland and soulless London suburbs that Bowie and no doubt Fowler escaped but June slowly faded away in. Not exactly standard Feather reading material. But a nice bit of kitchen sink realism just makes those aliens and dragons all the more exciting, right..? It's when the novel tries itself to be exciting and a little less downbeat, a little more fantastical (although no dragons, just to be clear), that its hold on my affections started to slip. Our narrator has the idiosyncratic voice of the unusual, quirky character behind it. And she annoyed me in a place I know very well. Lambeth, in central London, right on the river. It's there that lies a friend-of-friend's plush flat (I'll be damned if I'll use the A word!) that June is handily asked to house-sit the very weekend she has to be out of the house that her now-ex is selling. And it's there that she stumbles across intrigue, weird neighbours, and murder. Murder most fouuuul.... So she responds to this by running aimlessly around the streets, which geographically barely clicked together for me as I place I lived in during the years the novel was written (not in a plush flat, I must add, for my street cred's sake). It's an area I like, despite its grim appearance and total lack of decent pubs. But it wasn't quite in these pages, it's fictional form didn't quite ring true. There are some absorbing descriptions of the Thames, and Fowler nails the lonely and surreal desolation of a main city road at night. I was hopeful. I was enjoying myself. I wanted to uncover the mystery of the murder and I wanted June to survive despite her being annoying and knowing she would end up as she first appears, covered in blood. I really wanted to like this story. But it just falls short as a thriller. The encounters June has inside and outside the apartment block (damn! failed!) stretched credibility, and when a violent attack happens at the petrol station (I'll be damned if I'll use the G word) and it barely registers as an event, well, I started to frown at the book like a date that has farted whilst revealing they love Celine Dion. By the time (spoilers) our hero is being chased by adult gangsters on skateboards through city traffic as a helicopter chases them both, I realised what was bugging me about the tale. It is precisely Fowler's ability to involve you in the inner life of an everyday person, in an everyday setting, that makes his steering of that person and that world into ridiculous moments of action, interspersed with ridiculous behaviour by the hero, so unwelcome. I've read countless dumb 'airport' thrillers with unbelievable plots and lazy writing, but expected nothing more of them. The way Fowler can write makes this book different. And so sadly I must report for the second time in a row that a book has disappointed me. But at least I finished this one. And I look forward to reading some of this writer's other works, for, despite the forward's protests, I sense the reason this one was unpublished for so long was because it simply isn't as good as his other stuff. Like Hell Train. That one sounds like a gas.